In an effort to raise funds, thousands of public schools are encouraging parents and neighbors to shop on-line. More than a dozen new companies, such as Schoolpop.com and SchoolCash.com, have created web portals that enable users to shop a hundreds of on-line retailers. Most of the featured merchants are national chains or Internet-only companies, including Barnes & Noble, Toys R Us, Office Max, and Buy.com. In return for shopping through their portals, these companies rebate a percentage of each sale to the customer’s school of choice. Schoolpop.com, the largest of the school fund-raising sites, has raised an average of $100 each for 19,000 schools since its inception in 1999. The programs have been aggressively promoted by local schools and PTAs. Many have sent kids home with brochures (usually emblazoned with the logos of major corporate retailers) or arranged for speakers to tout the web sites at school meetings. Some have urged parents to dedicate a portion of their spending, such as all school supplies or holiday gifts, to on-line shopping. Although the sites have provided revenue for cash-strapped public schools, shifting consumer spending to on-line retail companies may do more harm than good, according to Dave Simpson, owner of the Lafayette Book Store in Lafayette, California. Simpson has been researching Schoolpop.com and related companies for the Northern California Independent Booksellers Association (NCIBA). There are two primary concerns. The first is that encouraging parents to shop on-line may reduce sales tax revenue. 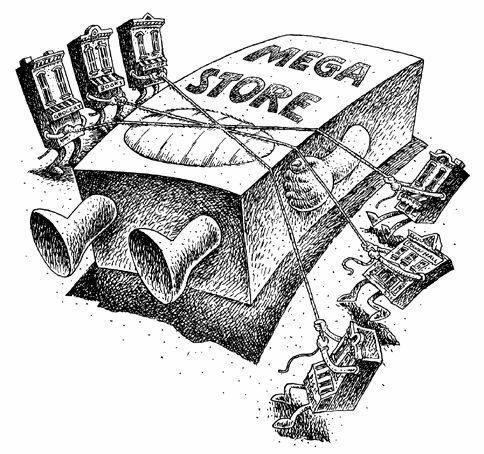 Web-based retailers are exempt from collecting sales taxes. Nearly half of all state income is derived from sales taxes and almost one-third of state income is spent on education. The rebates vary from retailer to retailer, but average between 3 and 7 percent. When lost sales taxes are accounted for, many purchases at school fund-raising sites produce a net loss for the community. A California resident shopping at a local store generates 8.25 percent in sales tax to pay for schools and other public services. The same purchase made at Amazon.com through SchoolCash.com would generate only 4 percent, a net loss of 4.25 percent. The second concern is that encouraging parents to shop at these sites may undermine locally owned businesses. Local stores provide economic and social benefits to their communities that far out-weigh those of distant corporations. The state income and local property taxes paid their employees are vital sources of revenue for public education. The NCIBA will be discussing ways to respond to school fund-raising dot-coms at a meeting later this month. The association’s strategy will focus on educating its members, urging them to meet with their local schools and PTAs, and offering alternatives. “We understand that schools need this revenue. Developing alternative funding sources will be central to our approach,” says Simpson. Encouraging local stores to develop or expand school fundraising programs in their own communities would be one option. Another would be to work with companies like Schoolpop.com to ensure that locally owned businesses are given as much representation as national companies. Schools could then encourage parents to support the school and the local economy when utilizing the sites. While most of the sites are limited to national retailers, at least one, Schoolpop.com enables shoppers to support local businesses through its Local Offers program. After registering their credit card and designated school with Schoolpop.com, consumers can shop at affiliated local stores and earn rebates. Unfortunately, the Local Offers program is relegated to a sub-section of the site and is not part of the main attraction.